Officers inspect the truck, which was operated by a driver from Canada who does not speak English. 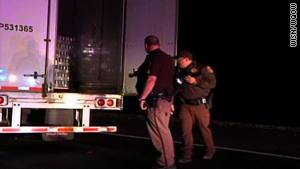 (CNN) -- A police dog's false hit for explosives on a truck that had been driven erratically by a man who did not speak English attracted a throng of law enforcement personnel to a rural road in Wisconsin on Thursday night. But they turned up nothing more powerful than energy drinks, police said Friday. The driver, Beant Singh Gill, 44, of Ontario, Canada, was taken to Monroe County Jail, where he is accused of fleeing an officer and recklessly endangering safety. Gill was hired less than a month ago by Puna Transport of Ontario, the company said Friday. Officers stopped the truck late Thursday after a chase along Highway 16 that lasted more than 20 miles and nearly 30 minutes, Monroe County Sheriff Dennis A. Pedersen said. "During the pursuit, the tractor-trailer unit was driven into oncoming traffic on numerous occasions and operated without regard for other traffic regulations as well," Pedersen said in a news release. Soon, Tomah Police Department officers and Wisconsin State Patrol units joined the pursuit, which started near Tomah and ended just west of the city of Sparta, Pedersen said. After three tire-deflation devices caused his truck to come to a halt in the middle of Highway 16, Gill refused for nearly 90 minutes to get out of the cab of the truck, Pedersen said. At one point, Gill got out of his truck but failed to follow instructions and was shot "multiple times" with nonlethal weapons, Pedersen said. That caused Gill to drop a bag he had been holding and get back into the truck, Pedersen said. Apparently, Gill does not speak English. Gill's employer told CNN that he speaks Punjabi, a language spoken in India and Pakistan. An interpreter from Fort McCoy -- between Sparta and Tomah -- was called in and persuaded Gill to get out of his truck a second time. This time, he was taken into custody without further incident. By now, the officers had been joined by the Monroe County Sheriff's Department, the Monroe County Combined Tactical Unit, the Sparta Police Department, the La Crosse County Sheriff's Department and its Emergency Response Team. After Gill's arrest, a bomb-sniffing dog indicated the trailer of the tractor-trailer unit may have contained an explosive, Pedersen said. That led authorities to keep the highway closed and to evacuate a half dozen nearby houses. It was not until after 1 a.m. Friday that the bomb squad determined that no explosives were in the vehicle. Other agencies involved in the traffic stop included the FBI, ATF, Wisconsin Emergency Management, Sparta Rural Fire Department, Sparta Area Ambulance Service, Fort McCoy Police, La Crosse Police, Monroe County HazMat Team, State Fire Marshal's Office and the 54th Civil Support Team. Pedersen said it was not clear what provoked the erratic driving. However, Pedersen added, "we know he appears to be very sleep deprived."